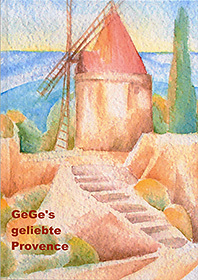 Compiled by Katharina Gessler Book format 21 x 30 cm, 60 pages with about 128 illustrations, some of which are large format and numerous artworks by GeGe (Georg Gessler). The Provence captured in paintings and photographs. As if by magnetic attraction, GeGe’s travels always led to the south. At all times, his destination was the land of the sun and the vibrating light, the dark shadows and the intense colours, the fragrant air and the scent of lavender.